Arrange the eggplant rounds in a single layer on a wire rack set on a rimmed baking sheet. Sprinkle with salt, cover with a second baking sheet and let stand for 1 hour. Pat dry. Light a grill or preheat the broiler. Season the eggplant with salt; brush with 2 tablespoons of the oil. Grill over moderate heat, turning once, until tender, 8 to 10 minutes. Transfer to the rack to cool. Cut into 1-inch pieces. Meanwhile, in a medium saucepan, heat the remaining 2 tablespoons of oil. Add the shallot, garlic, curry powder, oregano and cumin and cook over moderate heat, stirring, until softened, about 2 minutes. Add the cabbage and cook until softened, 3 minutes. 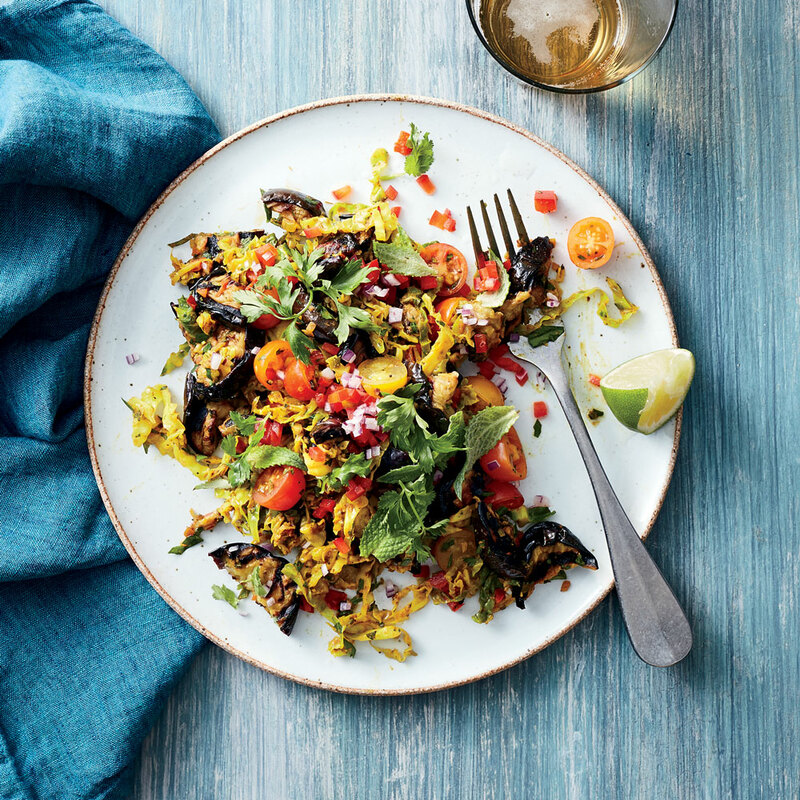 In a bowl, combine the eggplant, cabbage, tomatoes, bell pepper, parsley, onion, mint, cilantro and lime juice; season with salt and pepper. Top with parsley and mint leaves and cilantro sprigs and serve. Review Body: Roasted eggplant instead of grilling and used yellow onion instead of shallots and eliminated mint but still, GREAT warm or cold! My 8 yr old likes it, too.